Think of Joe Reynolds as an aviation detective, solving airplane crashes. He founded the RTI Group, LLC, a forensic consulting firm based in Stevensville, Maryland. Reynolds has been involved in many high-profile airplane debris investigations, including Air France 447, missing in the Atlantic Ocean for two years. Malaysia is sending a team of forensic experts, like Reynolds, to the Maldives to inspect debris found on the Indian Ocean archipelago to determine whether it might be related to missing Malaysia Airlines Flight 370. FILE - This image taken from video, shows a piece of debris from a plane, July 29, 2015, in Saint-Andre, Reunion. 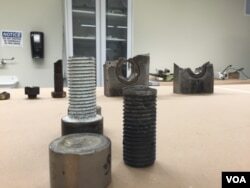 Reynolds took us inside his lab, to show us the steps of a typical RTI investigation so we could better understand what global experts are doing with the debris piece from MH370. The Malaysia Air 777 disappeared in March of 2014. The first large piece of debris found was a flaperon, fairly intact and in good shape, that washed up on the shores of Reunion Island in the western Indian Ocean. "This piece looks to be in normal condition with the green paint still showing," says Reynolds as he pulls out a structural piece from a box. "Scrapes, scratches, dents are all important to understand." He pulls out two more pieces that would have been attached to the first piece, these show thermal damage. "By looking at these parts we can tell the sequence that they occurred. And that is one of the most important things for us to learn," he explains. When the RTI group is hired to investigate a crash, their first task is confirming the part belongs to the plane. 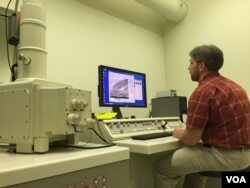 A scanning electron microscope begins analyzing the paint. Red peaks with letters and numbers show up on a computer graph. "Each of those red peaks represents an element on the periodic table," Reynolds says. 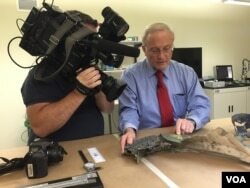 This kind of test could also be used by experts in the MH370 investigation because the plane's paint is a formula unique to the Boeing 777. 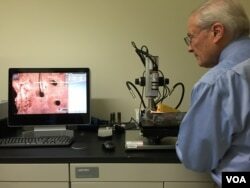 Back in the other lab room, forensic engineers check for "witness marks," any cuts, scrapes left by an adjacent part as it broke away. They also examine the forces that detached the parts from the main body of the plane. "Arms, levers, brackets, bolts to see how they look. What did they exhibit in terms of directional information, force information?" explains Reynolds. In this case, the rivets were stripped off at an angle. A digital high resolution microscope travels inside the holes, the computer image makes us feel like we are spiraling down a big hole with no bottom. The striations displayed from within the holes give clues to investigators. Forensic scientists take into account the length of time the debris sat in a corrosive environment, like sea water. They also examine how sea life, such as mussels and barnacles could have affected the evidence. Since MH370 has been missing for nearly a year and a half, the sea damage will be a factor. But the relatively good condition of the flaperon indicates the position of the plane upon impact, says Renolds. "I think it tells us the angle of the sea is at a low angle," Reynolds explains. It is painstaking, slow work. But the evidence from a lab like this can solve mysteries.